We recently have been involved in a number of valuation assignments which involved the allocation of personal and enterprise goodwill. In this blog article, we approach goodwill in the more general sense, referring to any and all value of a business that is not attributable to the business’s current assets (cash, accounts receivable, etc.) or its tangible assets (inventory, furniture, equipment, etc.). Overall goodwill can be further broken down to enterprise goodwill (also known as “business goodwill”) and personal (or professional) goodwill. 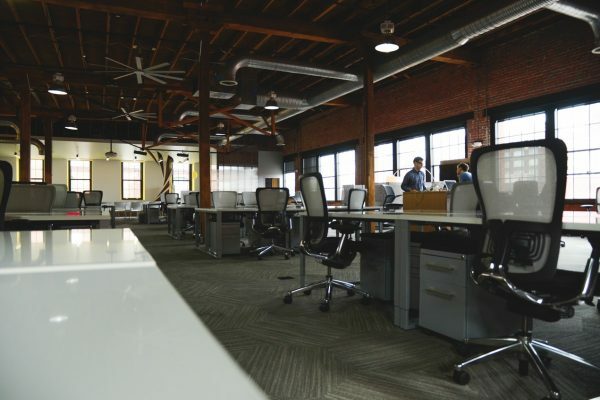 Enterprise goodwill is derived from characteristics specific to a particular business, regardless of its owner or employees working within the business. Personal goodwill is value associated with a particular individual working within the organization, rather than the characteristics of the business itself. From a valuation standpoint, one might question why the division between personal and enterprise goodwill matters. In fact, it depends on the purpose of the valuation, in many cases goodwill (personal or enterprise) is not allocated from overall company value. The total goodwill of the business is merely incorporated as part of its total enterprise value. For example, for a valuation prepared for gift or estate tax purpose we usually determine the company’s total value as a going concern. The resulting value often exceeds the value of the company’s tangible and monetary assets, indicating the existence of goodwill. However, the resulting goodwill is rarely further analyzed and allocated into the enterprise and personal goodwill. Similarly, under GAAP accounting rules, goodwill on the balance sheet represents the premium for buying a business above and beyond the identifiable assets of that business. Accountants take the purchase price and subtract the fair value of company’s identifiable tangible and intangible assets. What is left, and cannot be allocated, is goodwill. For this purpose, personal goodwill is not considered a separate asset, except as it may be captured in the value of a non-compete agreement. In other cases, like the sale of a business, the distinction between enterprise and personal goodwill could matter. One such case would be to assist in structuring a business transaction. In an acquisition, it may be beneficial to segregate out personal goodwill, since a buyer paying proceeds directly to the seller specifically for the personal goodwill (rather than as proceeds for the value of the company). Another reason for delineating personal and enterprise goodwill pertains to the process of evaluating the total consideration to be paid by the purchaser of a business. A buyer will be willing to pay only for the portion of the intangible value of an enterprise that can be transferred upon consummation of the transaction. 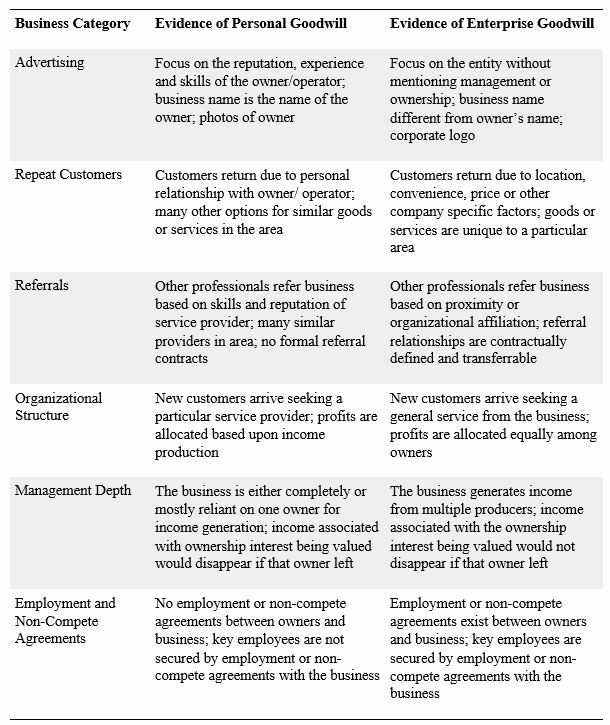 Based on the characteristics detailed above, this often results in only enterprise goodwill continuing with the purchaser. However, a transaction can be structured such that a portion of the personal goodwill, and its associated benefits, can transfer to the acquirer. This is often completed through the use of employment agreements. Once the existence of personal goodwill has been identified, the next step is to calculate its value. This is generally accomplished using the “with and without” method. without the individual’s continuing involvement. The with and without method utilizes cash flow models to project the revenues, expenses and net cash flows that a business would expect to realize under each scenario. Under the “with” scenario, the projections usually reflect the overall assumptions and cash flow projections for the business “as is.” As a result, this scenario includes the value attributable to personal goodwill of the subject key individual. The “without” scenario assumes that the enterprise would earn less revenue due to the loss of the subject individual. While the model may also assume that the subject company could hire a replacement for the key individual, most experts assume that it would take several years until the new individual could generate revenues and earnings comparable to those generated by the departing individual. Therefore, this scenario reflects a lesser value due to the entity’s loss of involvement by the individual. The American Institute of CPAs has partnered with the American Society of Appraisers and the Royal Institution of Chartered Surveyors on a new credential for financial professionals who provide fair value measurement services. The AICPA, ASA and the RICS began working together on developing a single credential that offers a more consistent framework for fair value measurement. The organizations are striving to be sure financial professionals have the necessary training, qualifications, experience and expertise to perform the work. They released a proposed framework in 2016. Financial professionals who receive the new Certified in Entity and Intangible Valuations (“CEIV”) credential would need to follow new uniform guidance on how much documentation is necesssary to support their fair value measurement results in company financial statements when they are producing valuations of entities and intangible assets such as trademarks, patents and technology, customer sales lists, and non-compete agreements. The uniform guidance for the credential specifies the level of documentation necessary to enable investors, auditors and regulators to understand more easily how fair value measurement has been used to determine the values of businesses and intangible assets. The CEIV credential also requires regular monitoring of credential holders to make sure they’re following the new guidance. To get the new credential, financial professionals need to meet certain eligibility requirements determined by the AICPA, ASA and the RICS, in collaboration with the Appraisal Foundation and the International Valuation Standards Council, which also helped develop the new credential. Those requirements include demonstrating competencies in valuation and fair value measurement through training and assessments, along with passing a two-part CEIV exam that will be introduced this year. We here at Advent are always trying to proactively respond to clients’ needs and are watching the developments closely and, if necessary, will be obtaining the new credential. Understanding the different facets of both divorce law and business valuation is crucial if either spouse owns a closely held business. 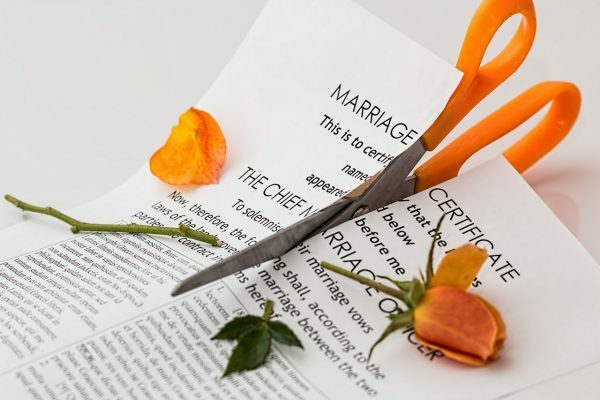 When it comes to divorce, that ownership interest will be classified either as a “separate” asset and not included in the marital estate for equitable distribution, or it might be classified as a “marital” asset that the court would include in marital asset distribution. In some circumstances a portion of the value could be deemed separate and the balance marital. Accordingly, it becomes necessary to value the business. The courts generally have wide discretion to decide what is equitable when dividing property. • What should the date of the valuation be? • What methods should be used to determine the value? • What does the business own? • Who does the business owe? • What is the business’s real profit? This post will discuss some practical recommendations to consider when determining business profits. While measuring the profitability of the business is only one of the requirements to determining value, in the matrimonial litigation context, it is often one of the more contested issues because profits not only impact the value of the business, but may also impact spousal maintenance determinations. There are numerous ways in which “profit” can be calculated because businesses differ greatly on how “revenues” and “expenses” are recorded in their books. Consequently, one needs to carefully read the business’s financial records and books so that the true profit can be accurately determined. If one spouse owns a business, there are several ways to learn what its income is; the simplest being just to ask. This is often more effective than many would think. Nevertheless, this may not be an alternative for many or often the response will not be accurate. Business valuation is a very complex process and will usually require an expert. Be sure to hire a business appraiser who holds a recognized business valuation credential, such as an ASA, ABV, or CVA, and one who practices business valuation full time. You may also need a CPA to help with the income reconstruction. Here at Advent Valuation Advisors, all or professionals hold either a CPA license and an ABV business valuation designation or have an ASA credential (Accredited Senior Appraiser) in business valuation, an internationally recognized business valuation credential awarded to highly experienced appraisers by the American Society of Appraisers. We have recently had an influx of clients coming to us and stating they are thinking about selling their business and need help figuring out at what price it should be sold. For many small business owners, selling a business represents the culmination of their entrepreneurial career. Most owners have worked very hard to build the business and make it what it is today but are thinking it may be time to slow down and enjoy the fruits of their labor. However, many business owners are surprised at the stress involved in selling their business. We suggest that the best way to minimize the stress is to prepare and begin to work through it step by step. Assess your reasons for selling. This is also the time to ask yourself what you hope to achieve in the sale, i.e. what is the amount you want to receive for your company. Seek out advice and help to develop your strategy from your trusted advisor. Consult with a team of professionals. Advent can handle the valuation. A commercial realtor or business broker can be a real help in terms of finding and dealing with prospective buyers or your company and helping you navigate the sales process. An attorney is also necessary to draw up and review documents necessary to sell the company. Determine what your business is actually worth. Here is where Advent can help. Determining your business’ value can be a complex process. You will want to identify a fair and objective price for your company that will attract buyers and doing so will require the application of one or more generally accepted methods of business valuation. 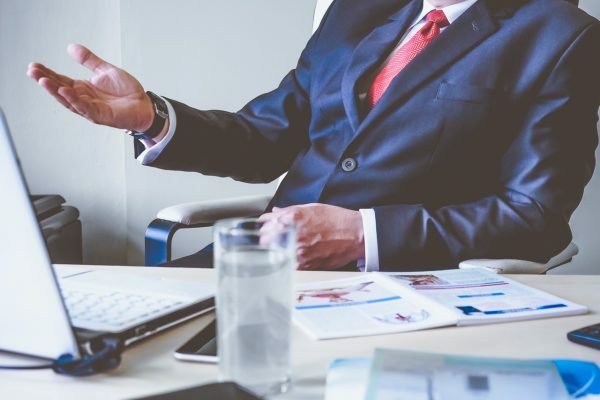 Understanding not only the what of a reasonable value but the way of a reasonable value often helps owners to put aside the emotional connection to the business that can lead to an inflated value for the company. Having a valuation performed may also reveal operational deficiencies that can reduce the value of the business or make the business difficult to attract offers. Get your business ready for sale (put the house in order). When you sell a house, there are usually things that need to be done to prepare it for sale and make it presentable to potential buyers. The same is true when you sell your business. Here is the chance to implement any of the operating deficiencies identified during the valuation. Potential buyers will want to examine assets such as buildings and equipment firsthand; but they’ll be even more interested in your business’ financial statements so you need to keep your business records up to date. With the help from Advent, you can also prepare a packet of financial information that reflects the financial condition of your business, presented in such a way that supports the asking price. Screen potential buyers. Not everyone who expresses interest in your business will be a serious buyer. Some people shop for businesses like women window shop for shoes. The problem is that showing your business to potential buyers takes time. Rather than waste time with insincere prospects, it is much better to screen buyers in advance and only meet with those who are truly serious. Business owners shouldn’t provide any information about the business until they have determined the potential buyer is capable of completing the transaction. It is not unheard of for competitors to disguise themselves as buyers in order to gain information about the competition. Finalize the sale. Once a deal has been negotiated it is up to the attorneys and lenders to finalize the sale. All you have left to do is sign a few papers and ride off into the sunset. Selling your company is serious business, so you want to make sure you take the time and trouble to do it right. Careful preparation and using the professionals, such as Advent, are the keys to the success. Call us. When a business finds itself on the road to serious financial trouble and unable to obtain financing from new or existing sources of capital, or solve its financial problems quick enough internally, it should pursue a solution through its creditor constituencies. This can be done either out of court or with the assistance of the federal bankruptcy code. Under either of these approaches, the debtor has many alternatives in seeking relief. The appropriate approach will be influenced by a number of variables, including the debtor’s size, financial history, capital structure, nature of the problems and the outlook for the business. In examining the options two major issues must be addressed; should the business restructure or liquidate and should the reorganization or liquidation take place out of court or in bankruptcy court? In choosing the best alternative it is imperative to understand what caused the debtors current troubles, whether the company will be able to overcome them and, if so, what actions will be required to turn the company around. Advent Valuation, as financial advisor, canassist the Company, or its creditors, in determining how the losses occurred and what can be done to evade them in the future. To aid in this determination, it may be necessary to forecast the cash flow of the operations for weekly periods for a term of thirteen weeks. This is one of the most powerful cash management tools. The 13-week cash flow projection is utilized by management of distressed companies to help manage and anticipate short-term liquidity needs. Advent can also be helpful in indicating where additional steps will be necessary in order to obtain positive cash flow. The best indication that a failing business has a reasonable chance for a recovery is the presence of three attributes. file a chapter 11 petition. For example where a company’s product is inferior, with declining demand, inadequate distribution channels, or other problems exist that cannot be corrected (either because of economic reasons or management’s lack of ability), it is normally best to liquidate the business immediately. 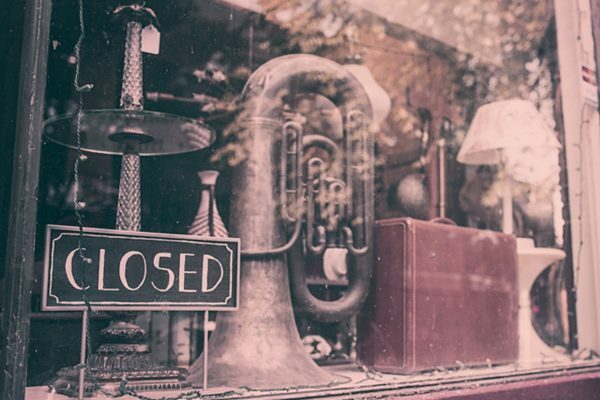 Postponing a closeout strategy greatly diminishes the liquidation value if customers abandon the company and business relationships deteriorate. Capabilities of management, including mismanagement, fraud and irregularities. In summary, hiring both Advent and a component bankruptcy attorney can help a company work through the question of whether to restructure or liquidate. Advent Valuations Advisors is here to work through the difficult questions with you.